Thomas James Store - Mathews County Historical Society, Inc. The Thomas James Store in Mathews County, Virginia, encapsulated within the building you see here is a rare and excellent example of an early nineteenth-century rural commercial building. Although it has undergone some alterations and was almost certainly moved from its original location, the store retains much of its original fabric and is remarkably well preserved for its age. It dates to c. 1820, and appears to be the oldest building in the downtown commercial district. It is a registered National Historic Building. Thomas James very likely built his store, a one-story vernacular A-frame wood structure, facing on Main Street. Its original floor plan measures approximately 375 square feet, with an attic above that has the same footprint. 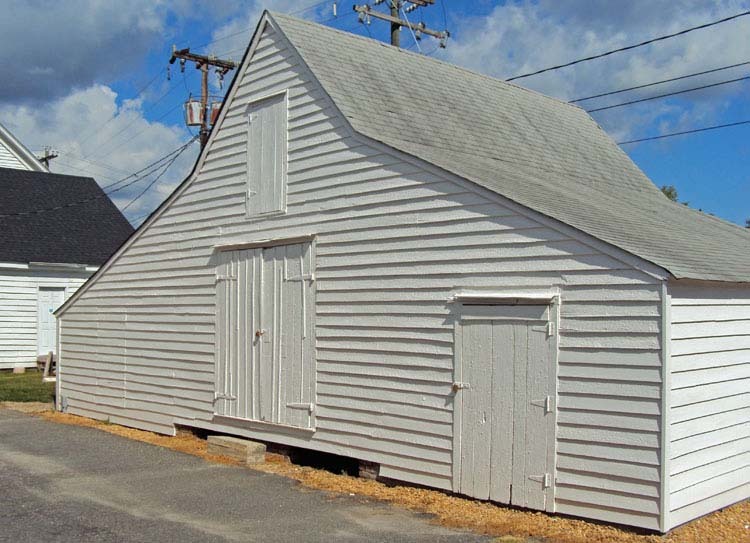 Shed-roof rectangular wings were a later addition on the east and west facades of the old building. By 1835, it was one of four "mercantile stores" in the Mathews Courthouse area listed in Martin's Gazetteer. Ten years later, James' heirs sold the store and the land on which it stood. Soon after that, the new owners evidently moved the old store to the back of the site, to be replaced by a larger building. This larger building was itself moved back about 1899, to make way for the even bigger store that still faces Main Street. This was built by Thomas James's grandchildren, Henry and Francis Joseph Sibley, who had recently acquired the property. Their descendants ran it until it was sold out of the family in 1989. Thus this remarkably complete site was a center for retailing in the heart of Mathews County for almost two hundred years, most of that time being owned and operated by one family. It is now a registered National Historic District. The Thomas James Store has the distinction of being one of the best preserved stores in the entire South. It has recently been stabilized, and is open to the public for display and interpretation on Friday and Saturday 10 a.m. - 4 p.m. and Sunday noon - 3 p.m. Access to the store is through the Mathews County Visitor and Information Center or on Maple Avenue off Main Street. Thomas James Store south facade. Thomas James Store in the NEWS!